If you're tired of poking at your tablet screen with a dirty twig, perhaps it's time to invest in a proper stylus, eh? Digital doodling specialist Wacom is knowledgeable about these kinds of things, and at IFA this year, it's introducing a new range of styli that might be just the ticket. The simplest of the bunch is the third-generation of Bamboo Stylus, a fairly standard model with a slight difference: The rubber tip is coated in carbon fiber, meaning there's basically zero friction when you're moving it around on tablet glass. There are two variants, as well -- one that's just the stylus (the solo) and another with a ballpoint pen on the opposite end (the duo). It comes in a choice of colors, from the more understated silver or gray, to the shoutier blue, green, orange and pink. Stepping up to the new Bamboo Stylus fineline grants you a more active experience, with its 1.9mm solid plastic tip capable of registering 1,024 levels of pressure sensitivity. It pairs with iPads (any model after the iPad 2) over Bluetooth, and has a battery that's apparently good for up to 26 hours of usage. Wacom's Bamboo Paper and a handful of other sketch apps support the fineline from launch, but the company expects that list to increase (and include Adobe's tablet software) before long. The fineline also comes in a number of color options, including silver, blue, orange and pink. For professionals that need that extra level of control, Wacom's adding the new Intuos Creative Stylus 2 to its digital pen roster. With a 2.9mm solid plastic tip, brushed-aluminum body and 2,048 pressure levels (like its predecessor), it also plays nice with any Apple slate beyond the iPad 2. As you'd expect, the Creative Stylus 2 works with Bamboo Paper and a host of serious doodling apps like SketchBook Pro, with wider support expected soon. Wacom hopes to make both the new active styli compatible with Android at some point, and has recently released its Bamboo Paper app for Google's platform. It's not completely up to the company, however, as tablet-makers also need to get on board with the idea to make it happen. 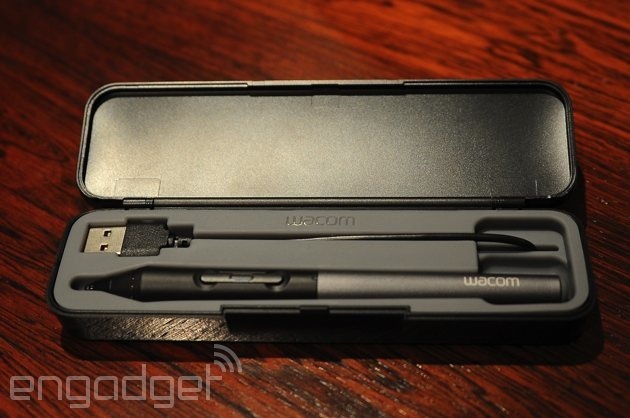 All the styli Wacom's announced are available to buy today, too. The new Bamboo Stylus will set you back $20/£17/€20 for the solo, or $30/£25/€30 for the duo. The fineline is a bit of a step up at $60/£50/€60, and the Creative Stylus 2 is top of the pile at $80/£65/€80.